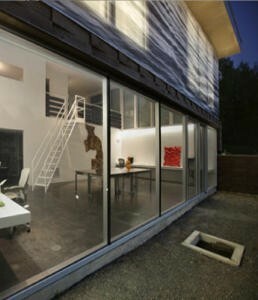 It’s the art and the architecture that characterize the contemporary ArtScreen Box House in New York’s Hudson Valley. Designed by American studio FT Architecture, this modern, innovative home showcases a striking photograph by artist Joni Sternbach, transforming the home’s facade into a collection of waves, peacefully trapped in time. This architecturally scaled photo, which is printed on woven vinyl mesh, drapes the home’s second-floor studio space, windows and all, transforming any harsh light into a soothing glow. From the inside, it’s as though sunlight is streaming in through the water’s surface. Interiors are exactly what you’d expect from a house with waves lapping at its exterior. A clean and minimalist style enhances the modernity of the home. The base of this 166 sq. mt. home’s lower level sits softly embedded in the one metre slope of the hill.